SEO headlines can be pretty ugly: they’re laughably direct, repetitive, and lack creativity. That’s because they’re designed to bring new readers to your site via Google or Bing. 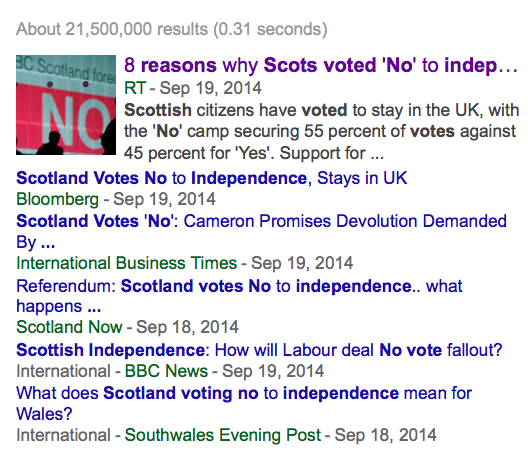 The best SEO headlines address both of the primary ways people use search engines: typing in keywords (Scotland votes no independence reasons) and asking questions (Why did Scotland vote no on independence?). SEO headlines should give away the heart of a story in the simplest language possible: make sure the subject of your story is in the headline, ideally at the beginning. How and why speak to the reader’s desire for an answer to a specific question, and new assure him your story will be timely. Here are the results of a Google News search for “scotland votes no independence reasons.” Notice how many of the results below contain who, what, where, when, why, how, and new. Let’s say I’m looking to replace the default calendar on my phone. A story called “10 Great New Calendar Apps” will probably mention at least one or two apps gaining popularity that I’ll want to try out. When you’re writing or editing a story, try out several SEO headlines by typing them into Google and seeing what you get. Glance at the number of search results and pay closer attention to the results you get. Are they similar to your story? You can test the quality of your headline beyond Google by using a tool like the Emotional Marketing Value Headline Analyzer. Although it’s designed for marketers rather than journalists, it can help you make the choice between two similar potential headlines. Try variations on your original headline, and go back and forth between Google and the EMVH Analyzer. For this story, I tried “5 SEO Tips for Journalists” first, and it scored a 20. “5 SEO Rules for Journalists” scored 40. I played around for a while longer, but couldn’t beat my high score. I then went back to Google to make sure “5 SEO Rules for Journalists” was germane, and it was. In this case, Google and EMVH were in agreement, but they aren’t always. Use your best judgment. SEO headlines aren’t necessarily make or break. Sometimes an editor changes a headline, and you want to respect her judgment. Sometimes a story demands a potential headline that’s so specific that it tanks on Google. And sometimes you come up with a pun that’s too clever to waste. Kate Mulcrone is Web Editor at Convene in New York City. She has worked at business-to-business publications in both the travel and events industries since 2008, and blogged and written entertainment features for MSN.